Heat the olive spread/butter in other pan add in grated beetroot, carrot and saute for 6-8minutes/until it get a bit dry. Now add in the boiled milk and keep stirring till beetroot, carrot gets cooked well. As the mixture thicken add dates molasses, coconut and mix well. Continue to cook on a medium high flame with continuous stirring. Once the moisture out from the mixture and starts to thicken. Add in cardamom powder and turn off the flame. Grease a 6x6inch/any tray and transfer the mixture and using the back of the spatula spread evenly and top with almonds and pistachios. Carrot is optional, just beetroot alone can be used. Milk and dates molasses can be substituted with condensed milk for the richness. Sweet taste can be altered as per the sweet tooth. 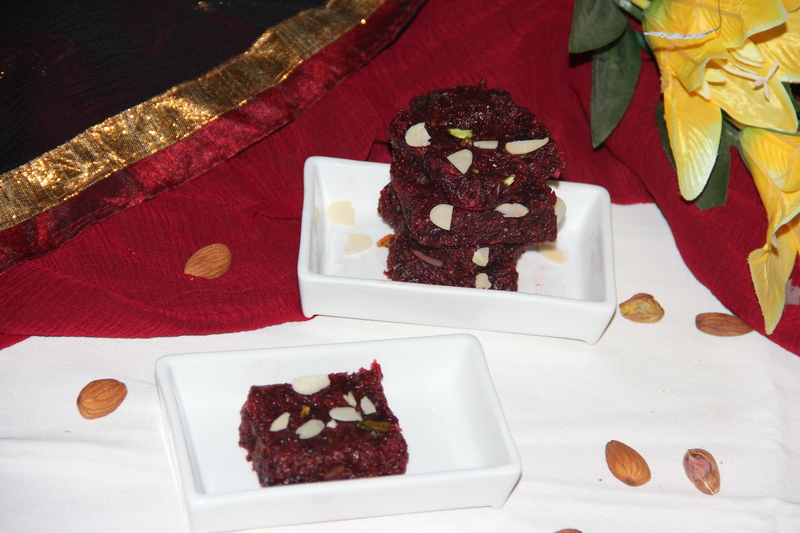 Posted on September 29, 2014, in Indian, Sweets and tagged Chitras healthy kitchen, Dessert recipes, drchdietfood. Bookmark the permalink. 18 Comments.